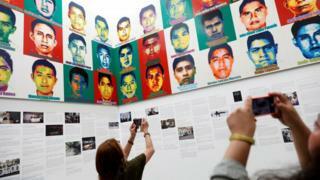 They depict the faces of the 43 Ayotzinapa Rural Teachers' College pupils who were kidnapped and disappeared in Iguala, Mexico. 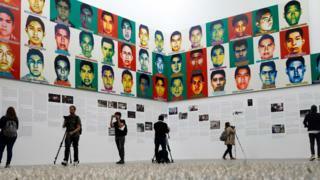 A timeline of key dates, such as their disappearance and the release of the government's official version of events, has been placed below the portraits. The 63-year-old cited crime that is "poisoning our society" as a motivating factor behind the pieces, he told Reuters news agency. He also said the "democratic" utility of Lego informed the exhibition, entitled Reestablishing Memories. 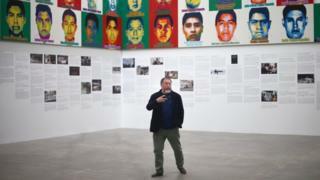 Ai, one of the world's leading contemporary artists, is well known for his politically charged projects and criticism of the Chinese government. He was detained by China's communist government in 2011.